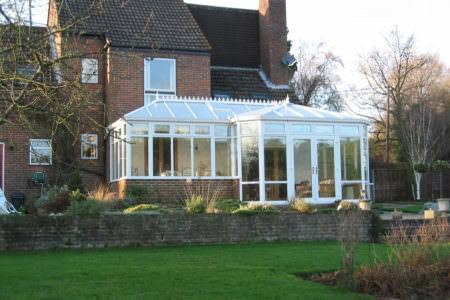 Victorian conservatories are characterised by their beautiful, multi-faceted design and traditional appearance. Their elegant finials and ornate finishing will capture the eye of any beholder. Very similar to the roof of a house where the ridge is the apex, the Victorian conservatory features an attractive high pitched roof. 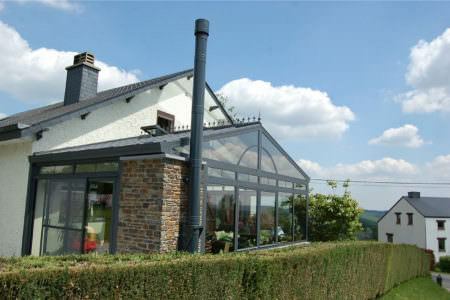 Double-hipped roofing is also available on this design which is ideal if your property has height restrictions. 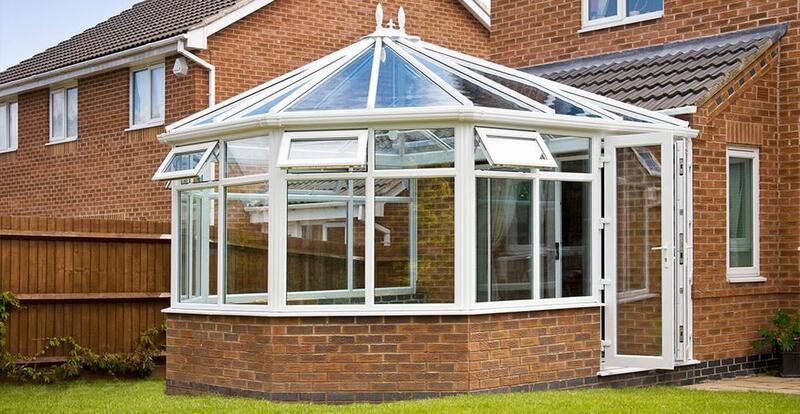 The traditional Victorian conservatory features classic, decorative finials and ridge crestings which echoe times gone past. 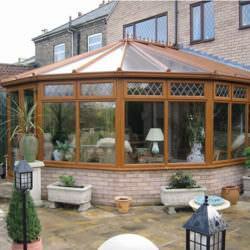 Victorian conservatories are multi-faceted which mean they form a shape similar to that of an octagon. This not only gives you heaps of space around the outside but also gives you an impressive view of the outside, giving you full appreciation of your garden and home. 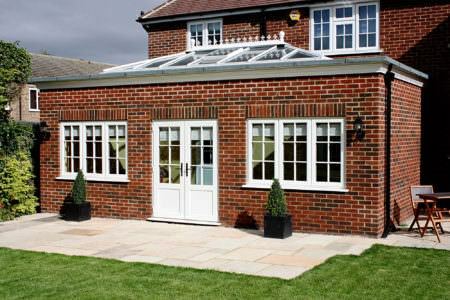 An engaging and stylish bay front plan provides a less demanding access course around the sides of the conservatory. This is especially of benefit to properties with a smaller garden where space is awkward and limited. 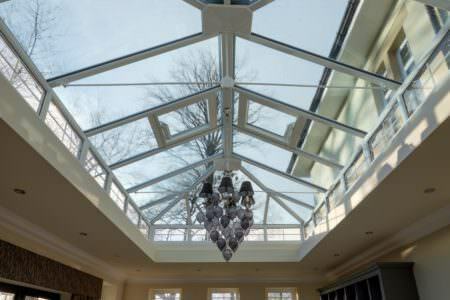 Victorian conservatories have a very versatile roofing system which means you can choose both the span and pitch. There is virtually no limit when it comes to shapes, sizes and configurations. The dwarf brick wall is a popular option as it allows furniture and ornaments to sit perfectly inside. It also provides a greater amount of privacy and insulation. The Victorian’s intricate cresting, finials and glazing gives you a true touch of period design. 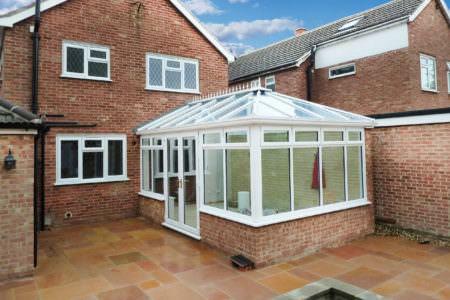 Those with Victorian properties find themselves drawn to the Victorian conservatory’s elegant features. 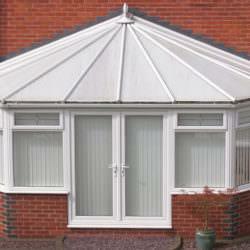 The bay-fronted design has many practical benefits as it provides an easier access route around the conservatory. This thereby allows you to make the most of your garden space. 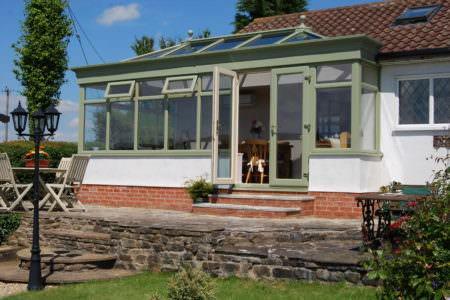 The multi-faceted Victorian conservatory is ideal for smaller properties and gardens with restricted space. 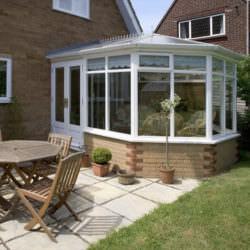 Victorian conservatories maximise space with their rounded edges which blend seamlessly into your property and garden. This design can even be extended into longer gardens. 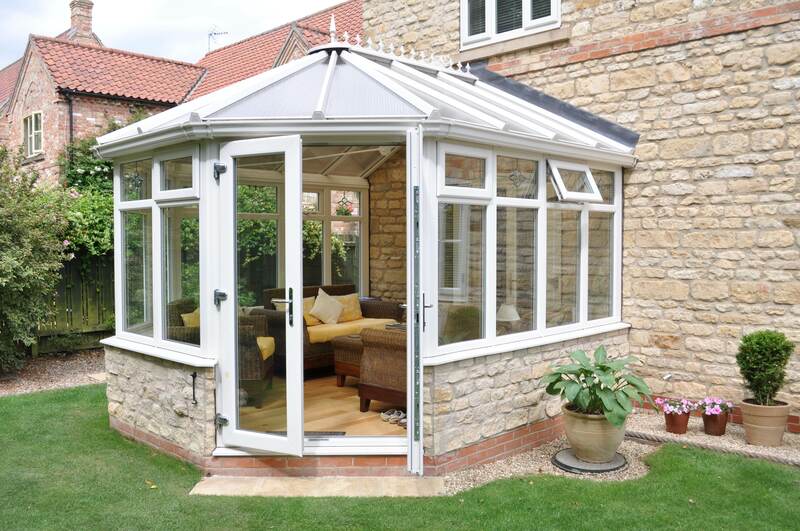 uPVC Victorian conservatories are available in a wide choice of colours and finishes – not just the standard clean White. 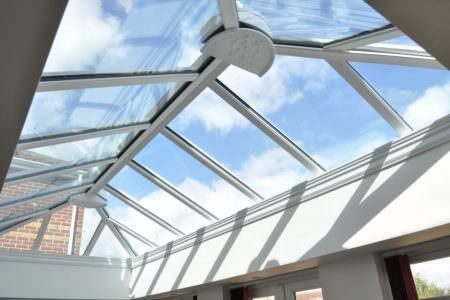 Your conservatory installer will be able to provide you with a multitude of options to suit your property. 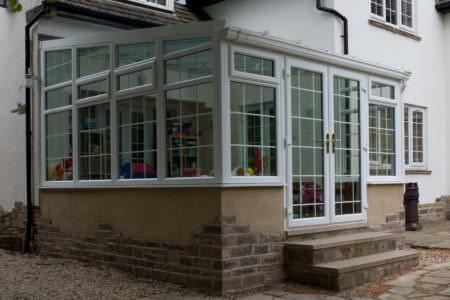 uPVC Victorian conservatories feature high-insulating roofs which provide maximum heat retention and light diffusion, allowing you to make the most of your conservatory all year round. 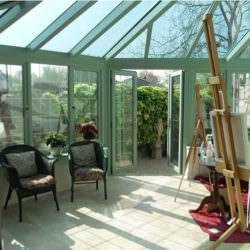 Victorian conservatories are full of character with their classic, period charm. 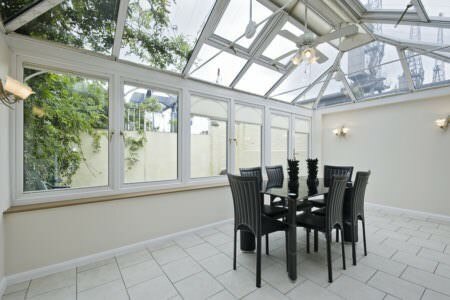 Whether you have a traditional or modern property, a uPVC Victorian conservatory will enhance aesthetics and improve value. Victorian conservatories are well known for their classic and elegant design, including beautiful traditional finials and cresting’s to the roof ridge. Many home owners choose this design for its timeless traditional appearance. The Victorian famously enhances all aspects of a period home, complementing existing brickwork and style. This is why it makes a great match for properties of the same era. 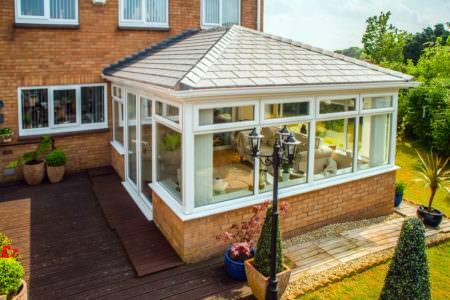 Strongly characterised by a multi-faceted structure, the typical Victorian conservatory presents you with a spectacular view of your home surroundings. Perfect if you enjoy your garden but also lack the dimensions – the Victorian’s soft and rounded facets will not impose on any outside space. 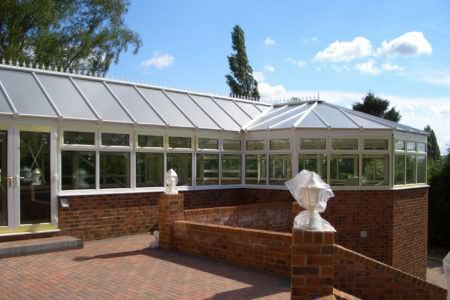 The Victorian conservatory design can either be fully glazed or have a dwarf wall incorporated into its base work. The option you choose will be dependent on your individual requirements. Are you after more light or do you want extra privacy? There are many Victorian conservatory styles available to home owners and each conservatory style can be made completely bespoke to you and your property specifications. 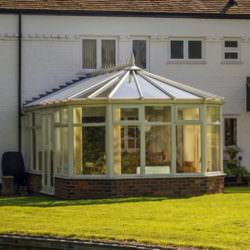 The most popular Victorian conservatory style has very distinguishing architectural features such as the bay front, steeply pitched roof and ornate ridge details. This has a bay front with three main windows – all widely angled for maximum space. This has a bay front with five main windows – giving a subtle rounded appearance. Crestings are either made from aluminium or uPVC. Aluminium crestings can be finished with a powdered polyester coating which can make surfaces more durable. uPVC crestings are durable as well but generally cheaper. There are now a multitude of colours and finishes available for uPVC Victorian conservatories – not just the standard White. 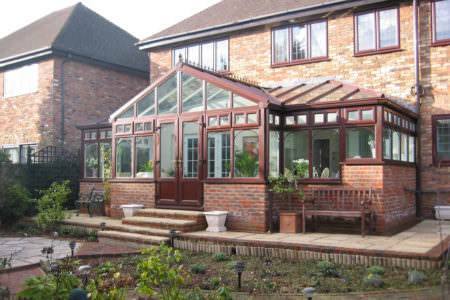 How you plan to use your Victorian conservatory will determine its overall aesthetics. If you are looking to maintain the traditional look of your property, then opting for a woodgrain colour and finish will complement your property superbly. 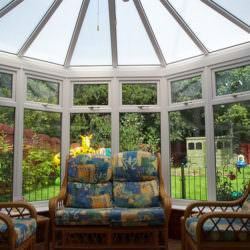 Victorian conservatory costs will vary between installers and will of course depend on personal specification of materials and style.